The raid on Dieppe on August 19th, 1942 is a controversial episode in World War 2. An Anglo Canadian force with some 50 Americans landed around dawn in an attempt to seize and temporarily hold, the port of Dieppe. A few hours later the force withdrew, losing 5,000 casualties, of which around 3,600 were Canadians. The operation was closely studied by American as well as British commanders and played an important part in shaping how the Allied lands on D Day. Commodore Hughes-Hallett, one of the naval commanders said that the Dieppe raid was intended as a small-scale rehearsal for a major cross channel operation, which would eventually have to be undertaken. He went on to say that the “lessons learnt caused a drastic re-casting of our ideas concerning amphibious operations in face of a heavy scale of resistance… A major disaster would have occurred had we proceeded to attack in North West Europe on the lines hitherto visualised.” Major General C J Haydon from Combined Operations spelled out the implications. Any assault would need the same level of fire support as an assault on a fortified position on land and mentioned El Alamein as a bench mark – one 25 Pounder per 17 yards. This could be provided by field artillery firing from their landing craft and specialist fire support craft mounting field guns and lighter cannon. The navy had been asked to build fire support craft, but the numbers required would mean revising naval constructions schedules and fighting for priority against demands for more landing craft or light craft as escorts or minesweepers. 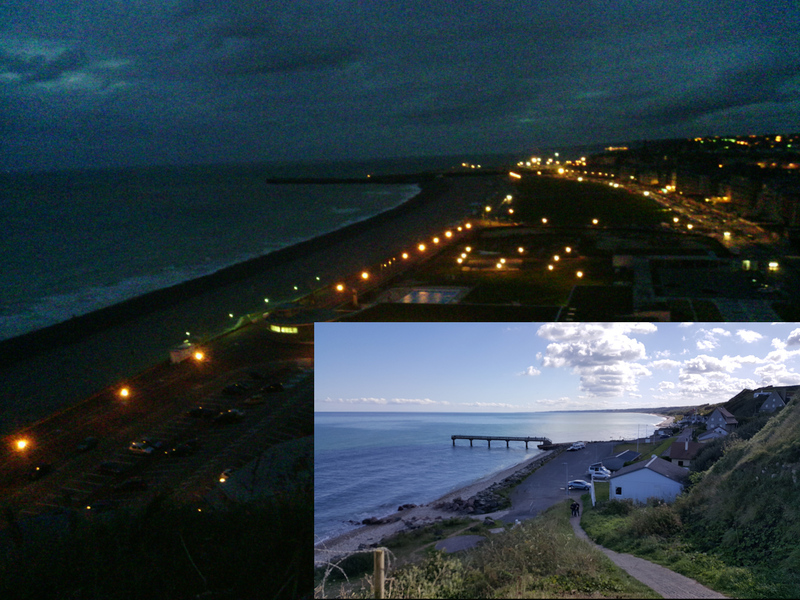 Until Dieppe the British had relied on surprise and aggressive commando tactics to carry out raids on occupied Europe. This was to a large extent out of necessity. There weren’t enough landing craft, nor small warships. Using these swashbuckling tactics British Combined Operations carried out a spectacular raid on the German held port of Saint Nazaire, sailing up the river Loire, seizing the docks and destroying the facilities. The same techniques of night approach and landings worked well in the Mediterranean. If half of the small craft needed to be fire support craft fewer soldiers could be landed. There were lots more “Lessons learned” in the report made in Autumn 1942. Extract from Combined Report on the Dieppe Raid, Combined Operations HQ , Whitehall , October 1942. -paragraphs 324-376 “Lessons Learned. 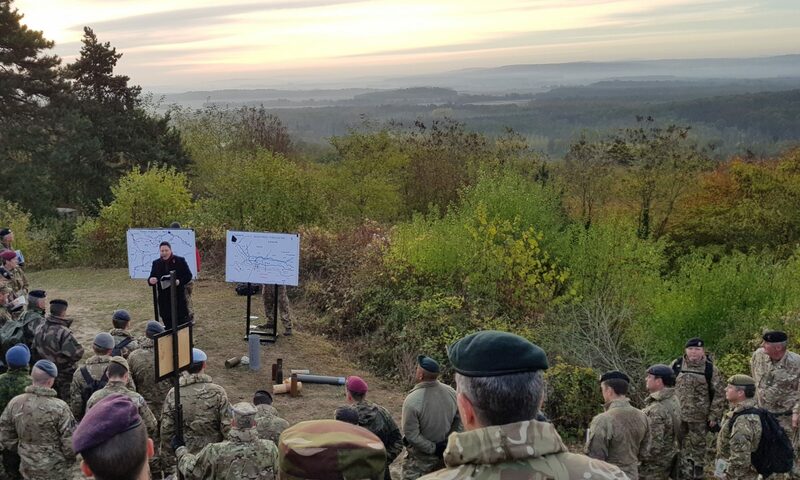 The conference also heard presentations by British Major General Hobart on specialized armour, on drills developed by combined arms teams of infantry, specialized tanks and engineers tackling a typical German defence position. It wasn’t just British talking. Colonel O’Bare USMC added the US Pacific experience, in particular deploying Army Divisions to the Aleutian Islands. 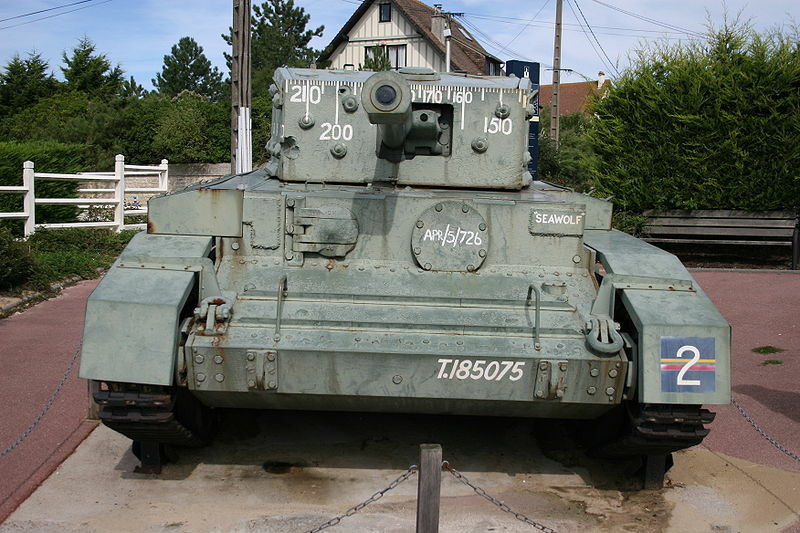 Dieppe was also a stimulus to an important armoured vehicle used on D Day. Shortly after the raid a Canadian Engineer was looking at the problem of protecting engineers working to clear routes for tanks. The Churchill tank was adapted as an engineer vehicle, capable of carrying engineer stores and mounting a 165mm petard mortar for demolition work. 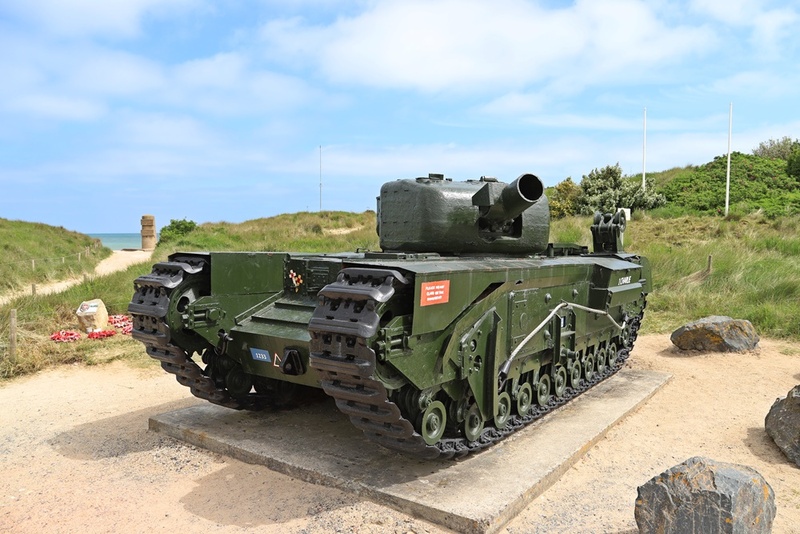 Although the British had developed a family of specialist armour – flails and bridge laying tanks, The Churchill AVRE was a more versatile platform. An entire assault brigade of three battalions would be used by the British and Canadians on D Day. The Germans also learned lessons. It confirmed OKW’s optimistic view that an attempt at invasion could be destroyed on the beaches and reinforced the view that the Allies would attack a port and encouraged the Germans to waste resources in the wrong places. 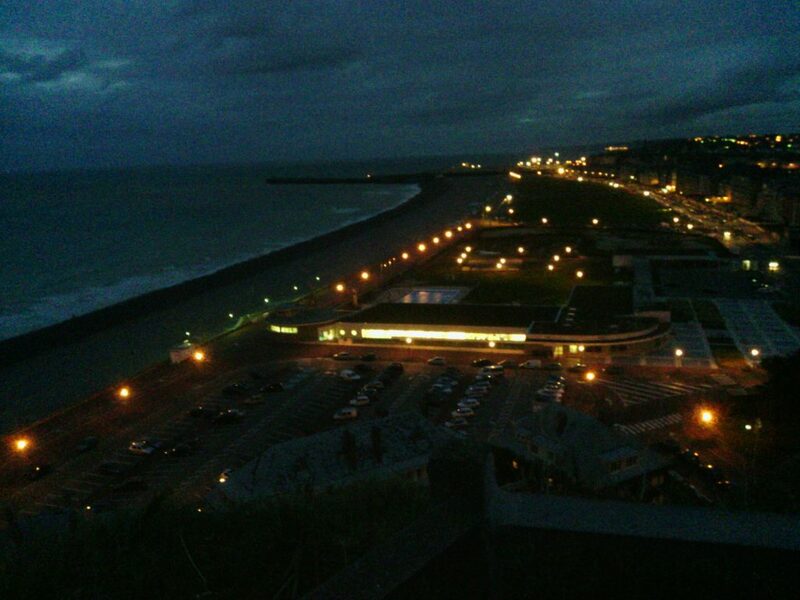 The lessons from Dieppe are controversial. Many people argue that these lessons were obvious or could have been learned from other operations such as the Allied landings in the Mediterranean or Pacific. However, these arguments are counter factual. We can never know whether the D Day planners would have learned from other peoples experience, or whether they would have deduced the level of fire power for what Combined Operations argued were the unique circumstances of the Ciorss Channel Assault. The Germans drew some important lessons from Dieppe: the wrong lessons. 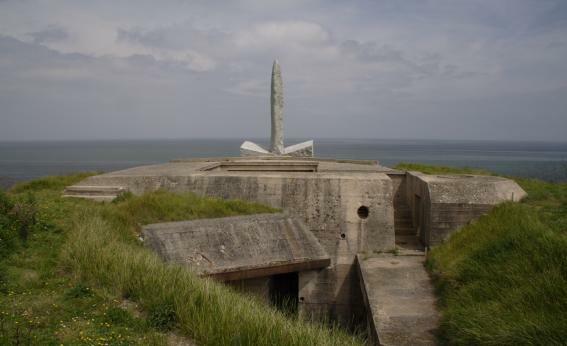 The incomplete bunkers on Gold and Omaha beach are reminders that the invasion coast was fourth out of fifth in the German defensive priorities for the Calvados coast. 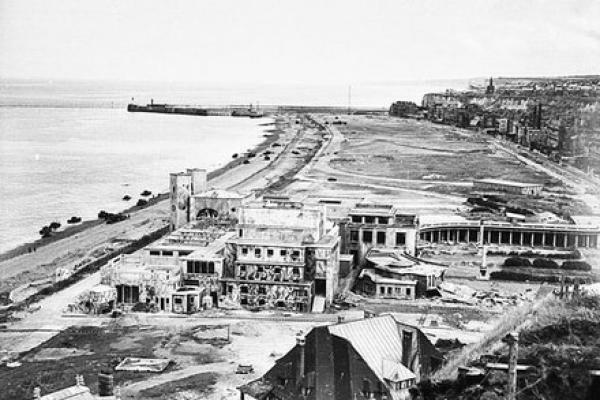 The Germans poured ten times as much concrete protecting ports that would not be attacked. 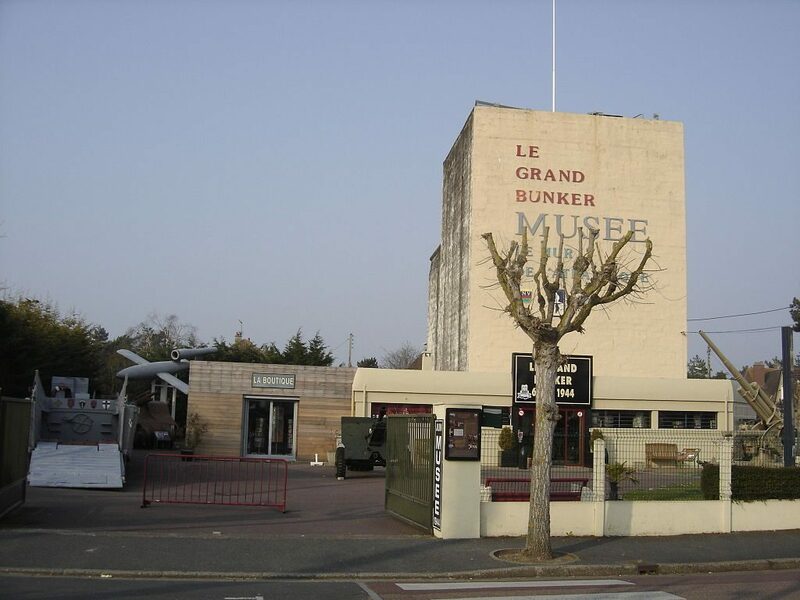 The AVRE engineer tank at Greye-sur-Mer, on the western end of Juno Beach was one of the many from the Assault Engineer Brigade that supported the British and Canadian landings. This particular tank was buried for half a century. Dieppe was the first action in which US troops participated against the Germans 50 Rangers were attached to No 3 and No 4 Commando. The US Army was impressed with the aggressive tough training of the Commandos to set up their own version. The idea of a floating prefabricated harbour was developed before the Dieppe Raid. However, the realization that it would not be possible to capture a harbour intact led the Allies to develop techniques and technology to support landings over a beaches. Eighty obsolescent Centaur tanks were landed on the British and Canadian beaches to thicken up the fire on the defences particularly for the last ten minutes of the run in. These were originally intended as the turrets for close support Armoured Landing Craft, part of the armada of fire support craft for D Day. The variously gun and rocket armed support craft do not have the iconic status of the LCVP or LCA. There are models of the different types of modified landing craft in museums covering the landings at Arromanches and Utah Beach. 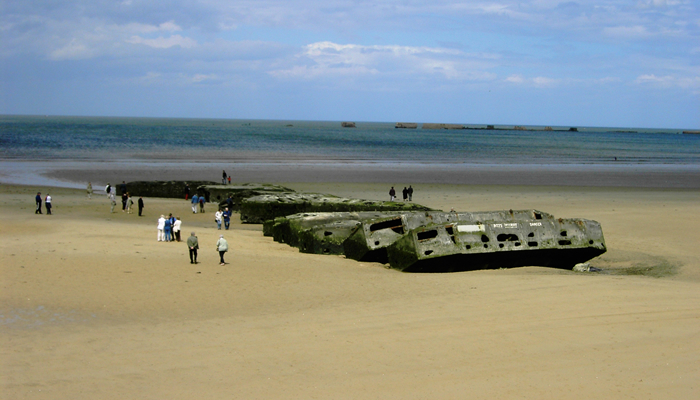 “Seawolf” at Hermanville-sur-Mer bears battle damage. A second Centaur is in the Memorial-Pegasus museum. The 2nd Canadian Division provided the bulk of the troops for the Dieppe Raid. It was spared D Day, but landed in Normandy in early July. 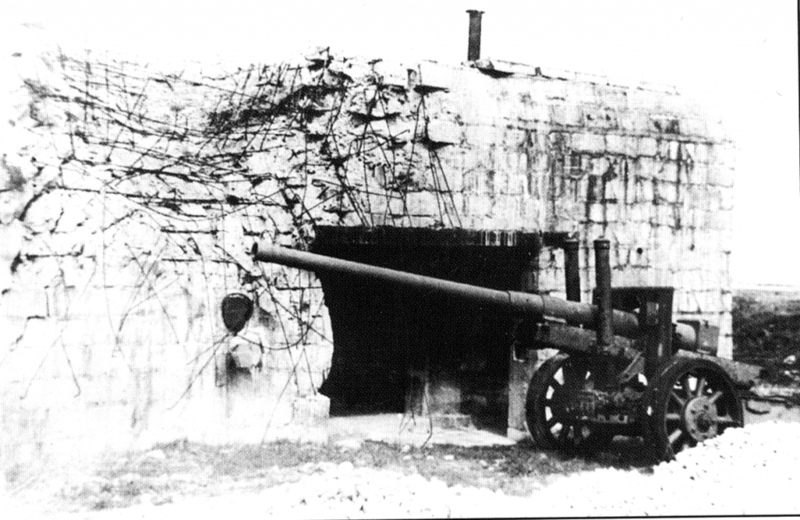 They were one of the formations that captured Caen and heavily engaged in the fighting between Caen and Falaise. 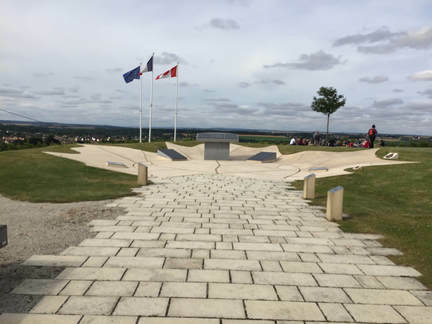 The Point 67 memorial on Verriers ridge overlooks the battlefield of Operation Spring 25-27th July 1944. The 2nd Division attacked over this open ground South of Caen to keep the SS Panzer Divisions pinned on the Caen front while the US 1st Army attacked west of St Lo. This fighting cost the Canadian forces over 1,300 casualties, their worst loss since Dieppe. 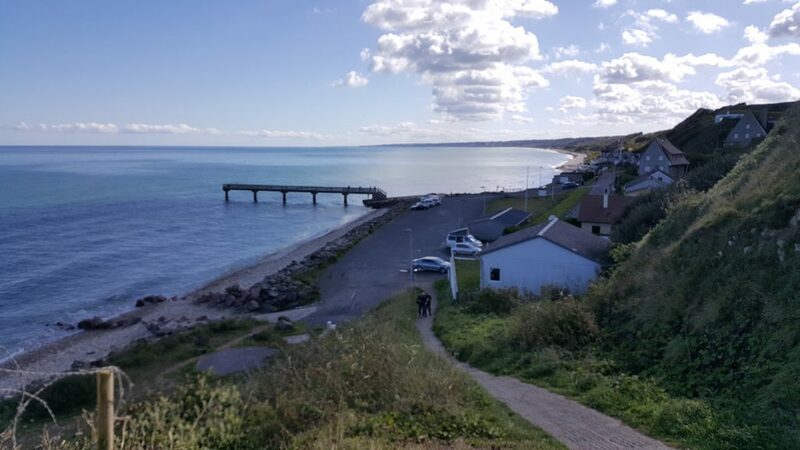 The coast along Omaha Beach is rather similar to the Dieppe beach front, Regardless of whether Dieppe could or should have been attacked from the front or the flanks, for large stretches of the French coastline there were only a few places where an army could land. These were obvious to the defenders and heavily defended. 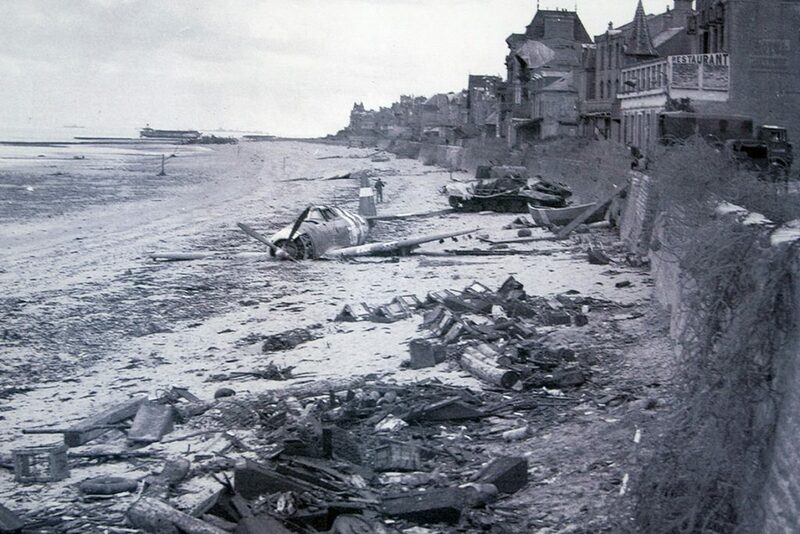 It was obvious that any attack on the Calvados coastline would include landings on Omaha beach. About half way along Omaha beach there are two prominent memorials, the concrete Liberation memorial and the steel Les Braves sculpture. 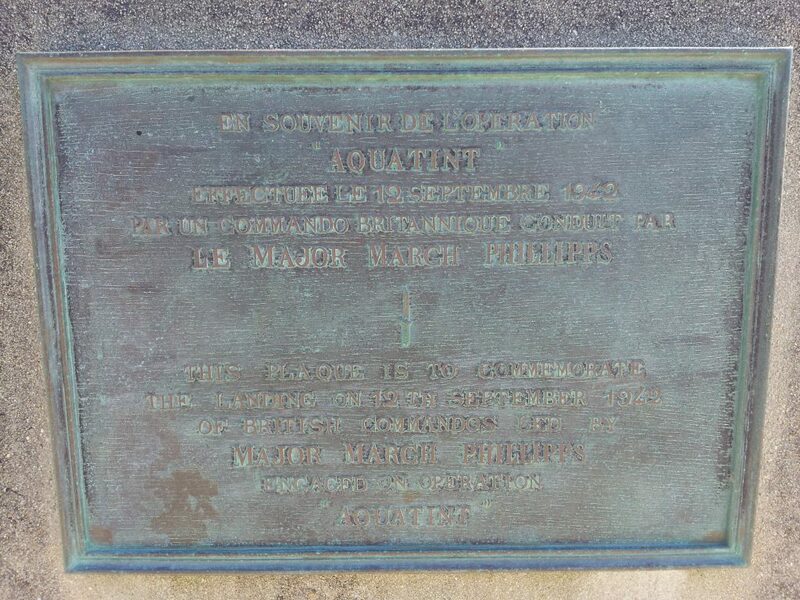 About a hundred yards to the west, on the seawall is a bronze plaque to the memory of Major March Phillips and his men who fell in Operation Aquatint on 12th September 1942. 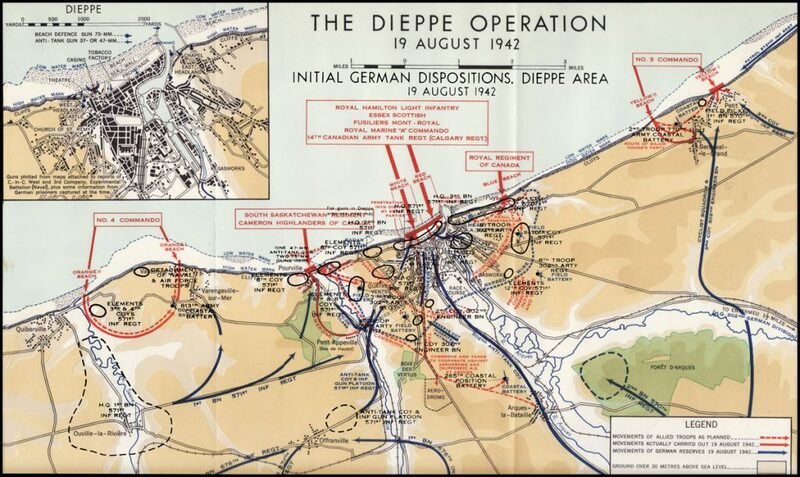 After Dieppe Combined Operations was ordered to focus on preparations for the cross channel assault. No 62 Commando was left to stage small scale raids, which they did off the Channel Islands. On 12 September a navigation error resulted in the raiders landing in the middle of what would become known as Omaha Beach in the face of an alert defence. Three commandos were killed and others captured.